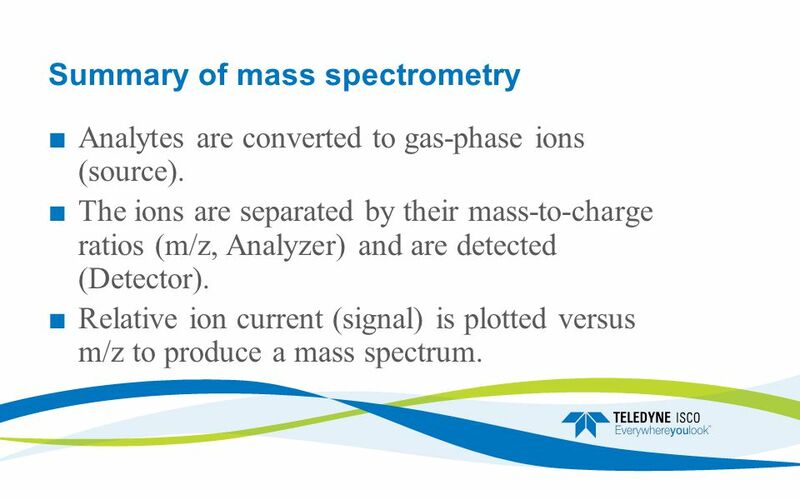 4 Summary of mass spectrometry ■ Analytes are converted to gas-phase ions (source). 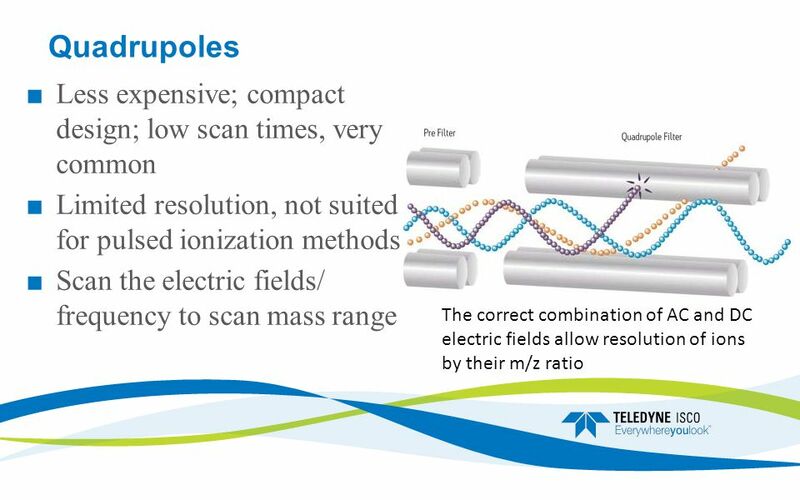 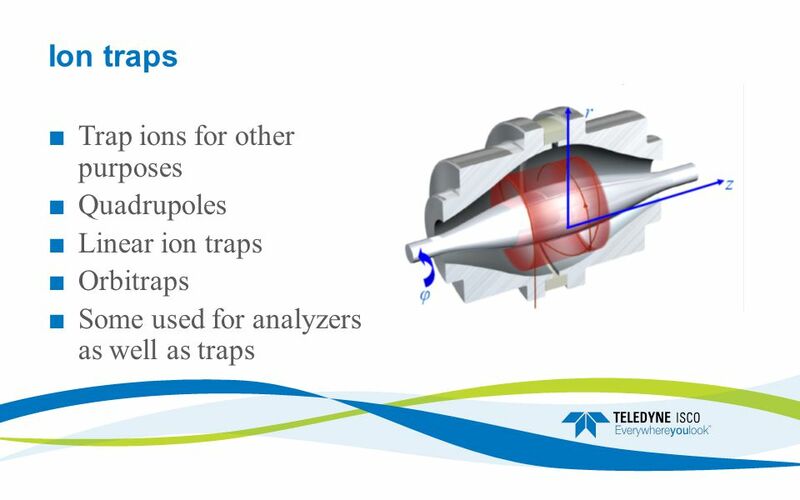 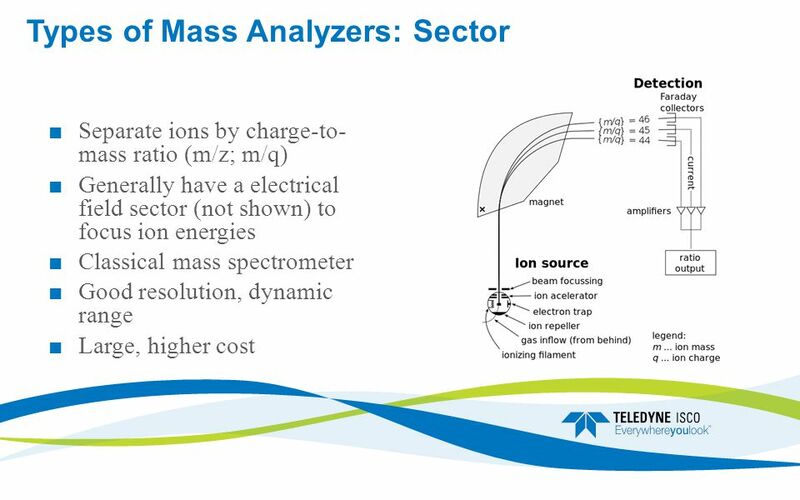 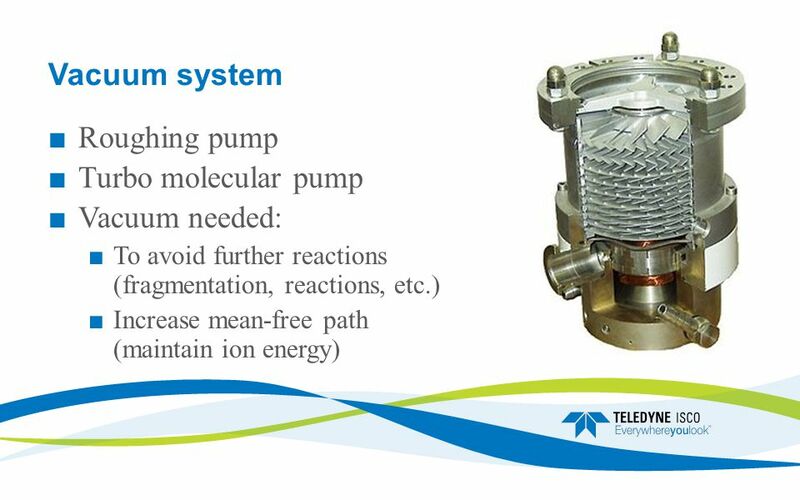 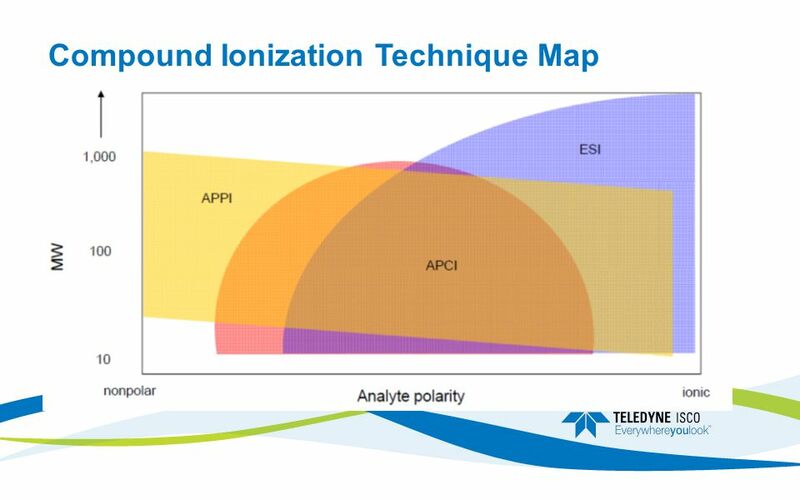 ■ The ions are separated by their mass-to-charge ratios (m/z, Analyzer) and are detected (Detector). 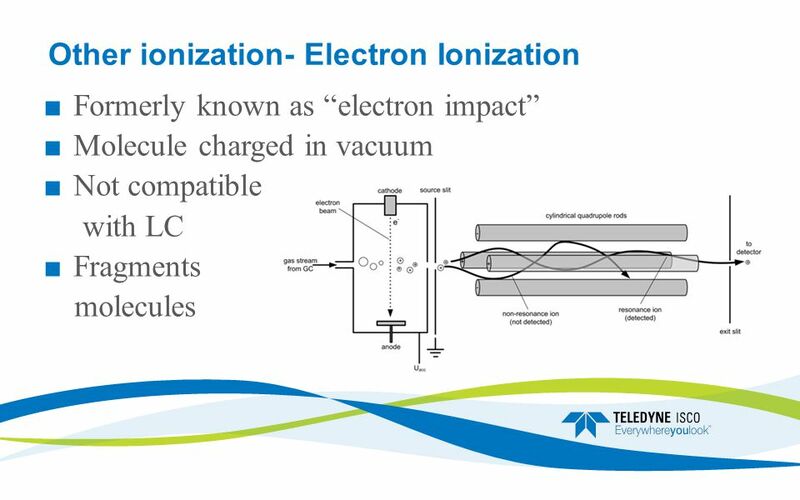 ■ Relative ion current (signal) is plotted versus m/z to produce a mass spectrum. 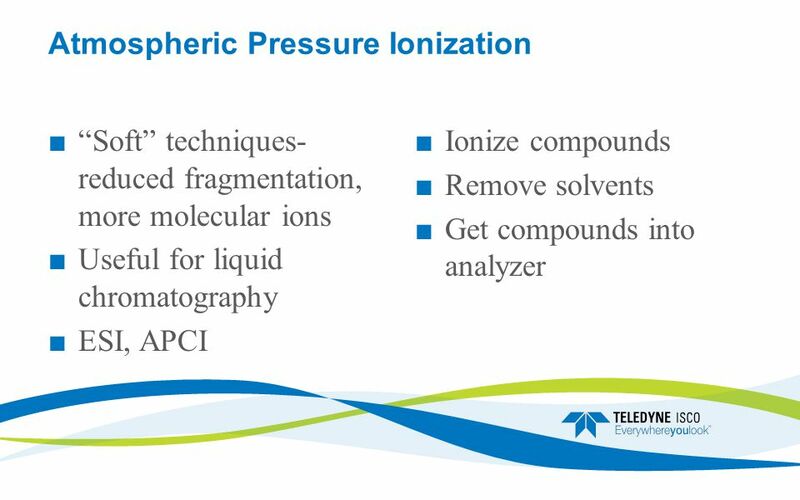 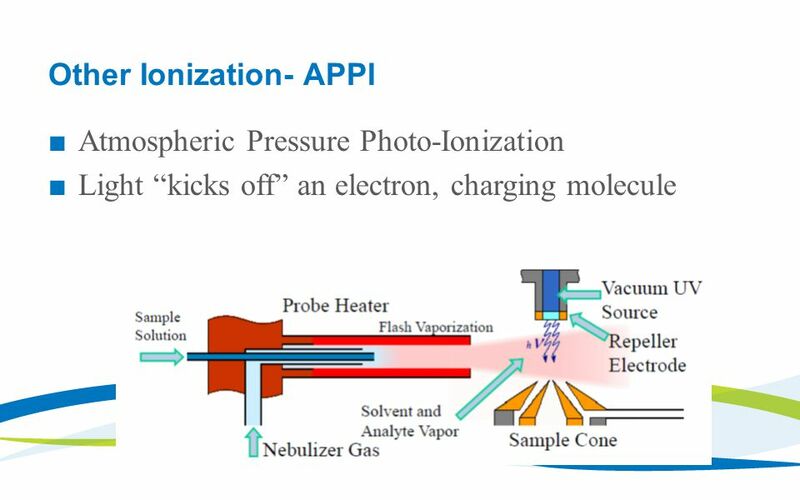 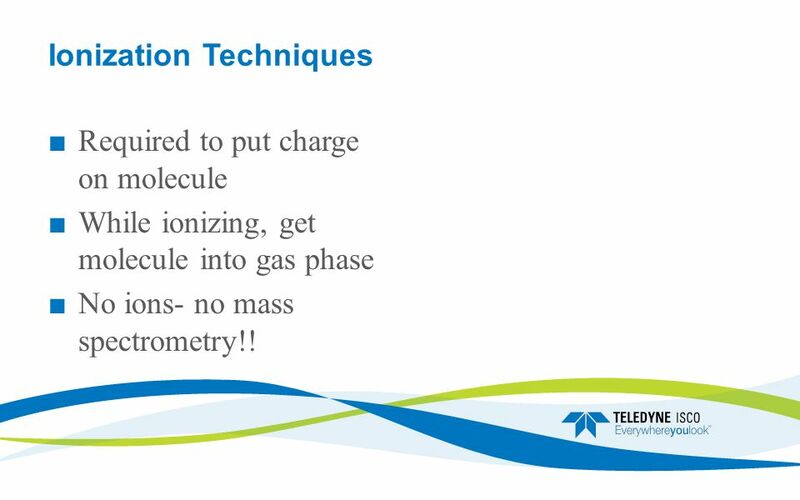 19 Ionization Techniques ■ Required to put charge on molecule ■ While ionizing, get molecule into gas phase ■ No ions- no mass spectrometry!! 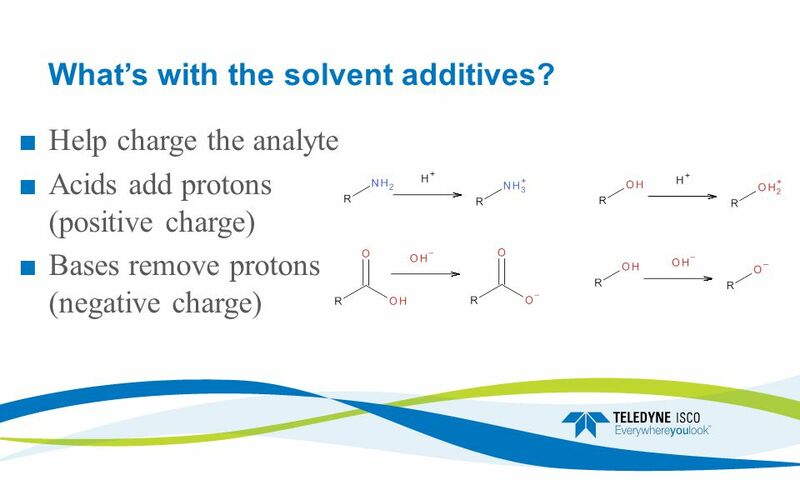 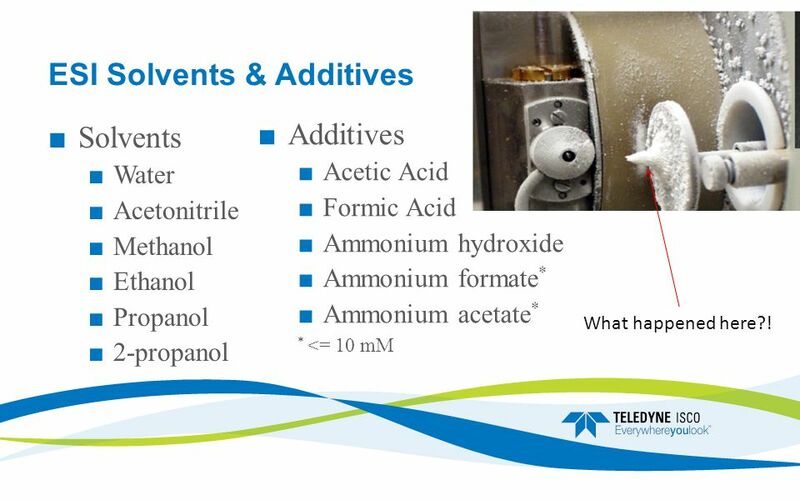 23 ESI Solvents & Additives ■ Solvents ■ Water ■ Acetonitrile ■ Methanol ■ Ethanol ■ Propanol ■ 2-propanol ■Additives ■ Acetic Acid ■ Formic Acid ■ Ammonium hydroxide ■ Ammonium formate * ■ Ammonium acetate * * <= 10 mM What happened here?! 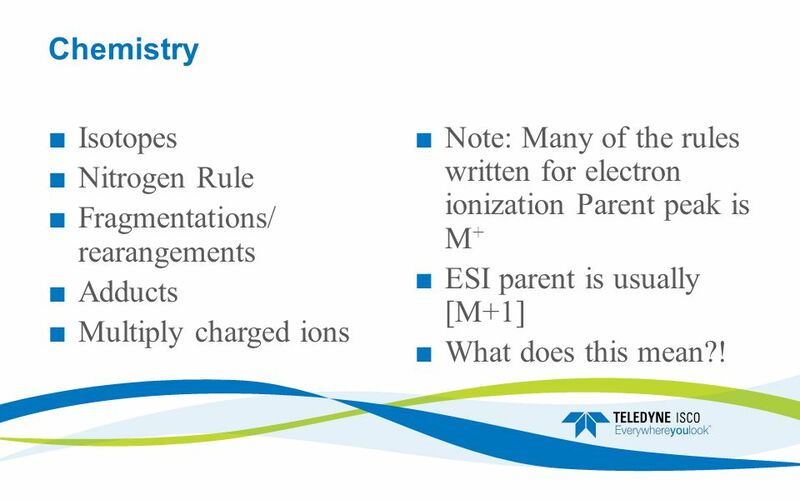 40 Chemistry ■ Isotopes ■ Nitrogen Rule ■ Fragmentations/ rearangements ■ Adducts ■ Multiply charged ions ■Note: Many of the rules written for electron ionization Parent peak is M + ■ESI parent is usually [M+1] ■What does this mean?! 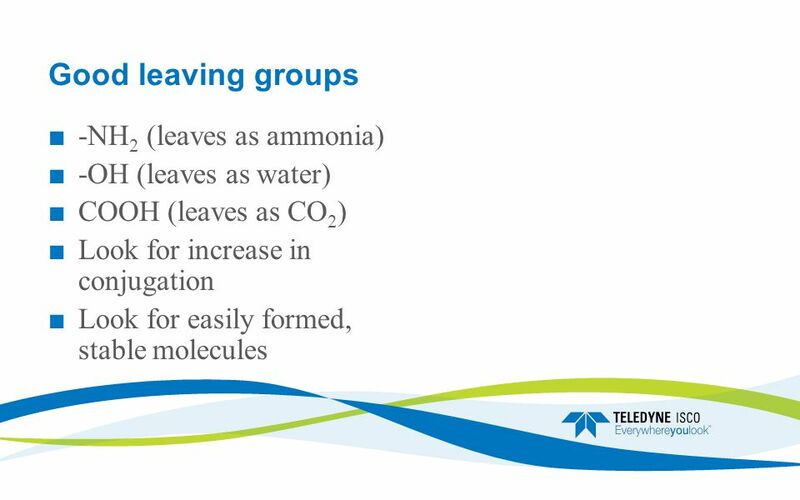 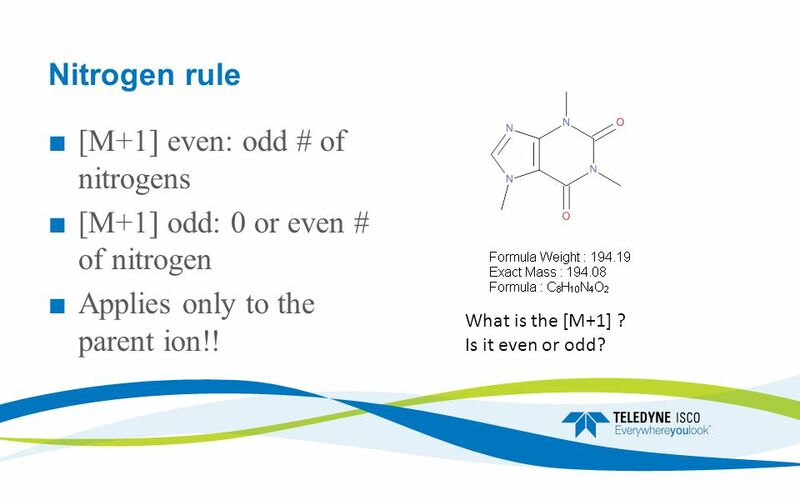 41 Nitrogen rule ■ [M+1] even: odd # of nitrogens ■ [M+1] odd: 0 or even # of nitrogen ■ Applies only to the parent ion!! 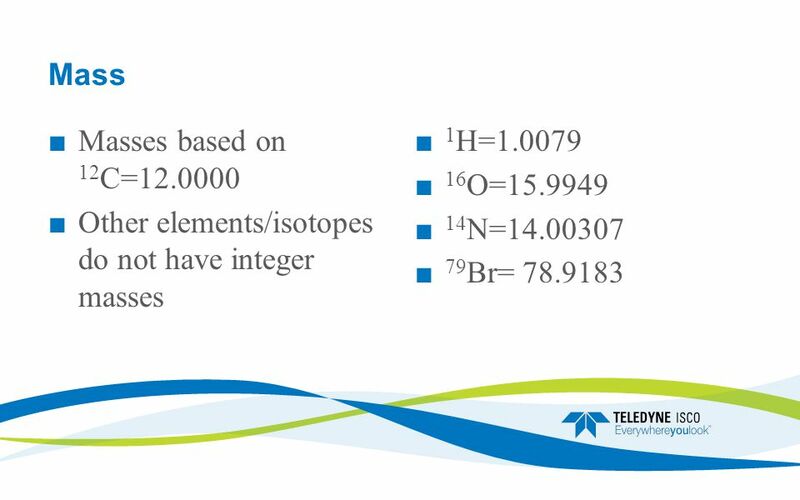 What is the [M+1] ? 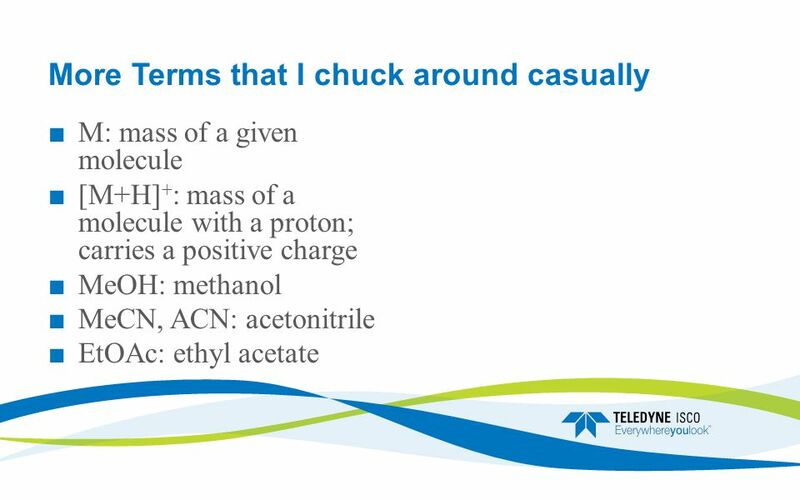 Is it even or odd? 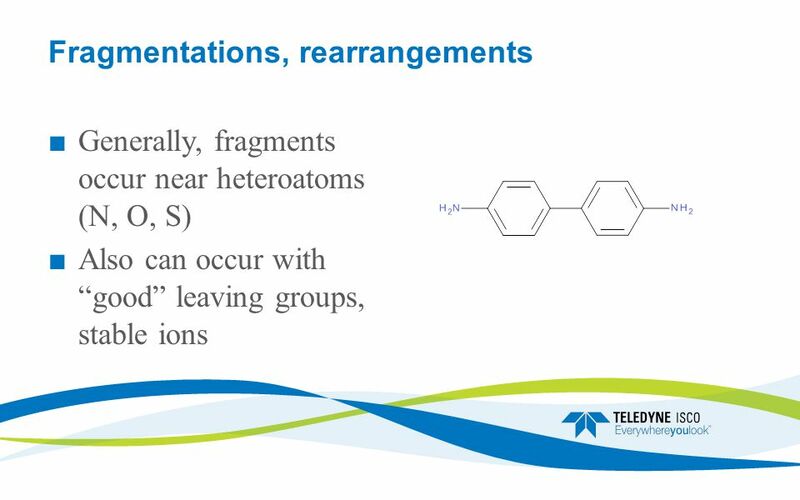 42 Nitrogen rule ■ Synthesized compound has 2 nitrogens ■ See peak at m/z=168 ■ Is this a fragment or a parent ion? 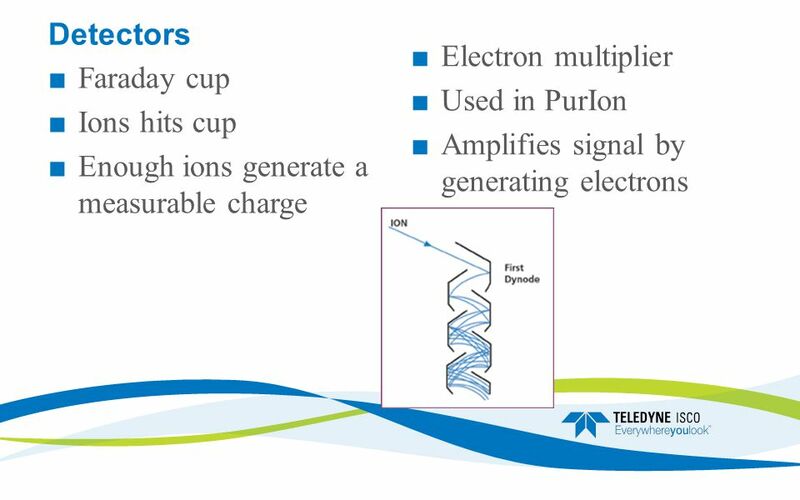 ■ Why? 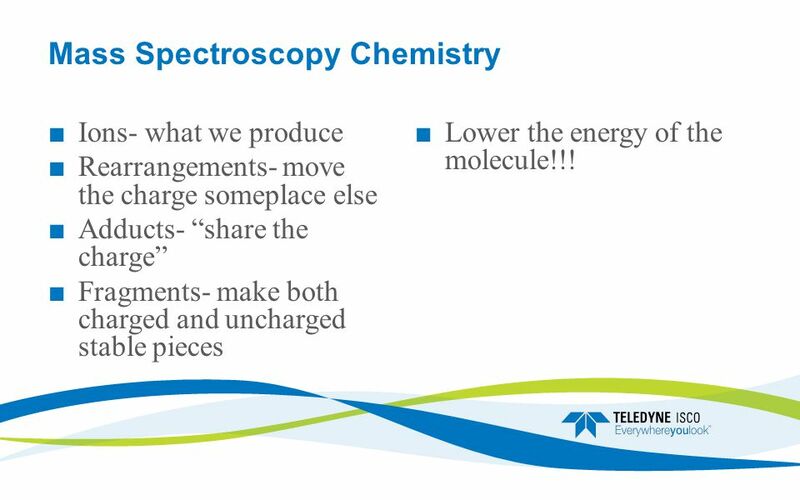 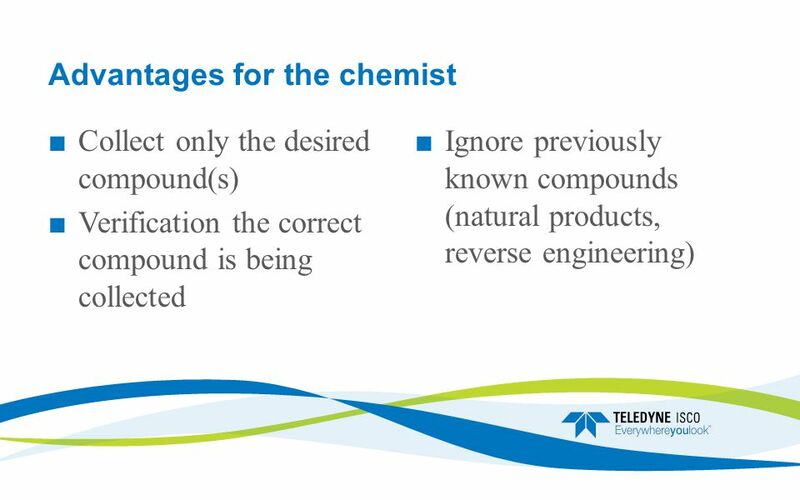 43 Mass Spectroscopy Chemistry ■ Ions- what we produce ■ Rearrangements- move the charge someplace else ■ Adducts- “share the charge” ■ Fragments- make both charged and uncharged stable pieces ■Lower the energy of the molecule!!! 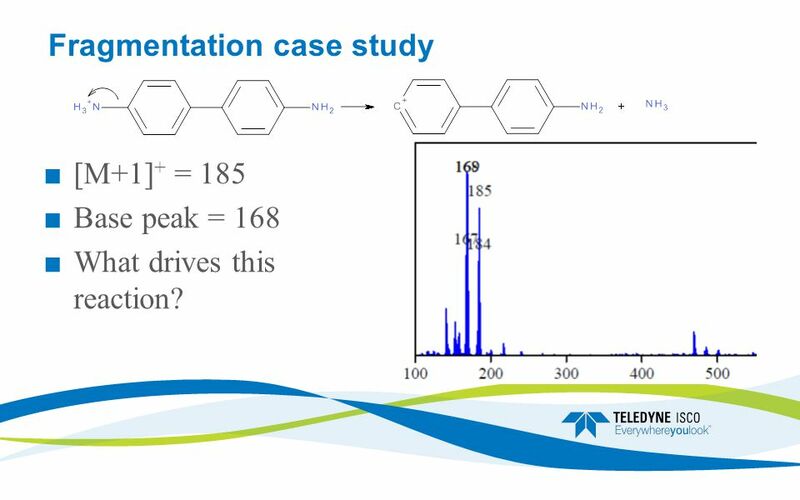 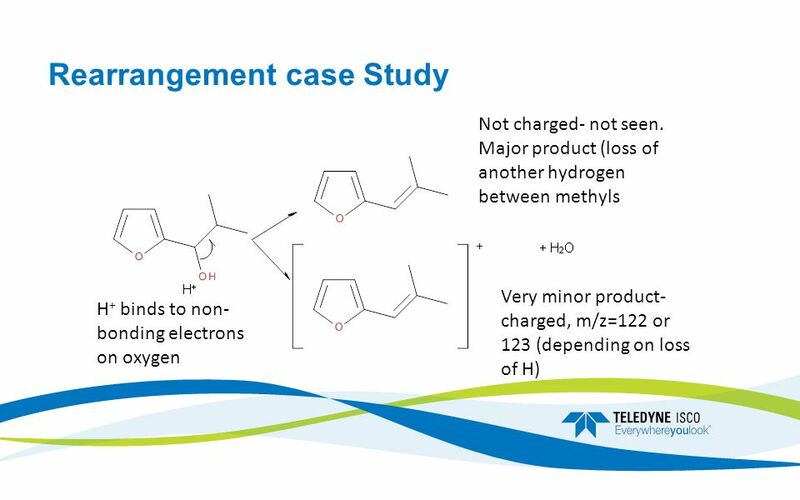 46 Fragmentation case study ■ [M+1] + = 185 ■ Base peak = 168 ■ What drives this reaction? 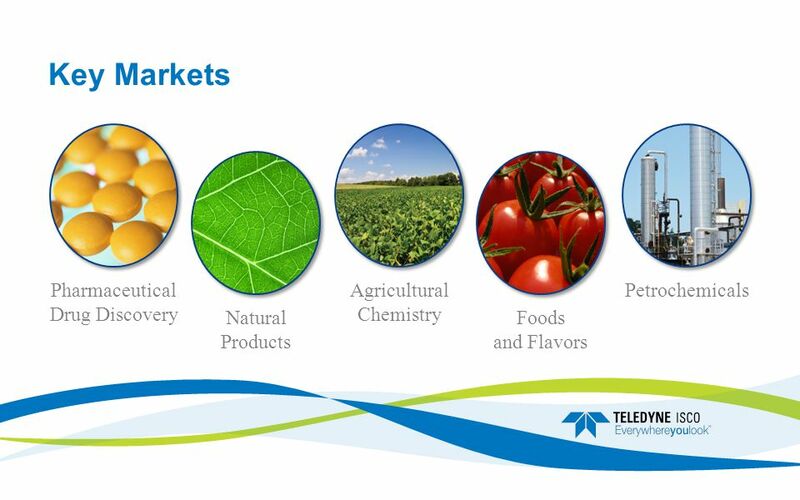 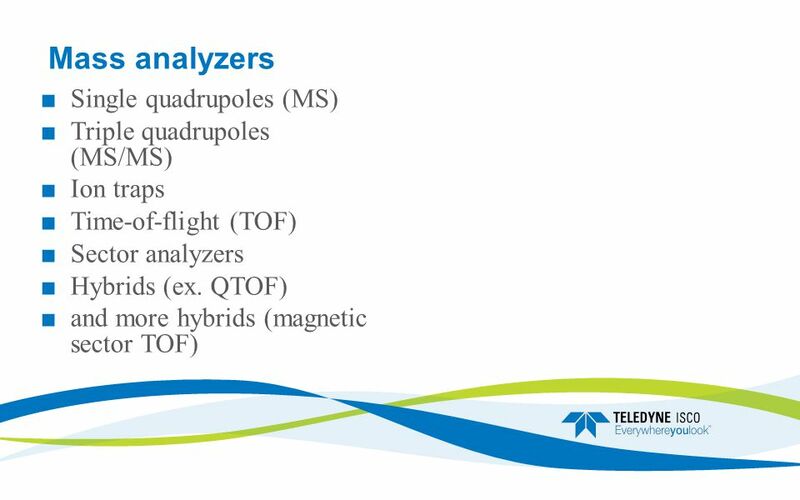 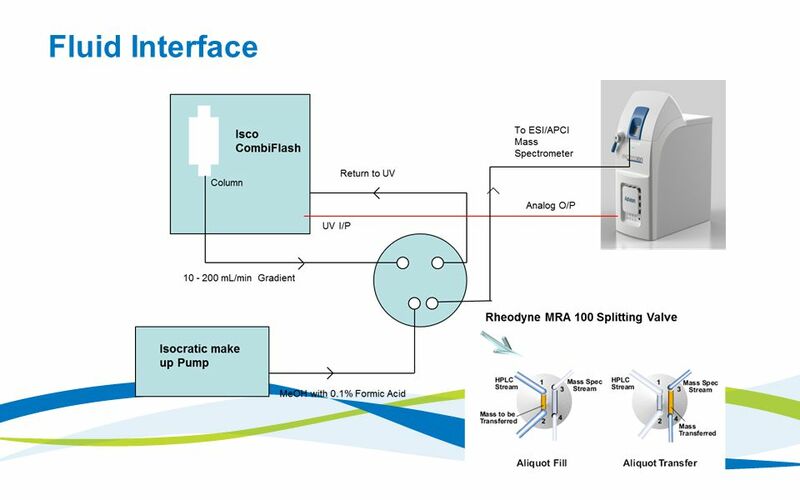 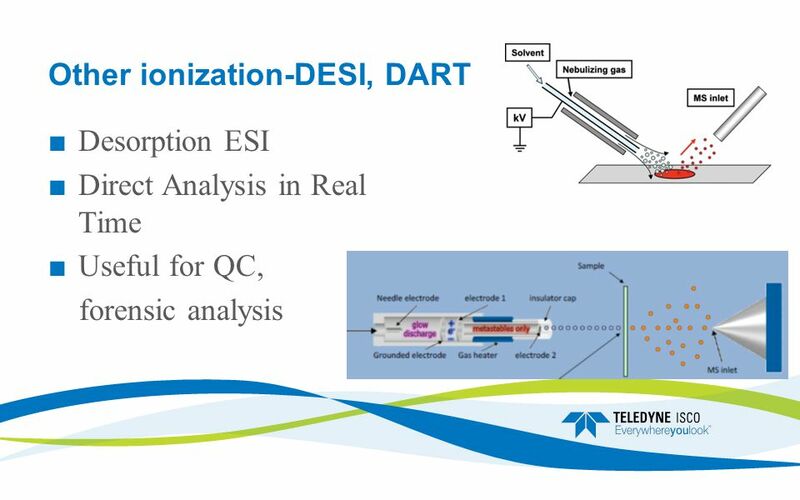 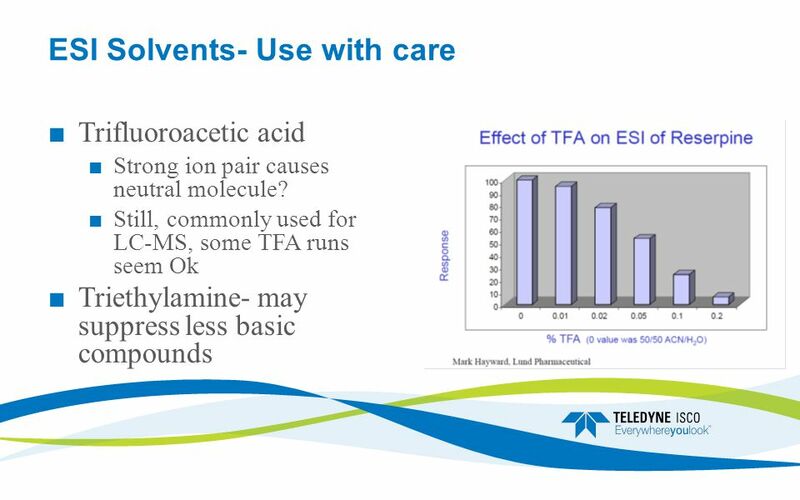 Download ppt "FC-MS from Teledyne Isco CombiFlash ® a Name You Can Rely On." 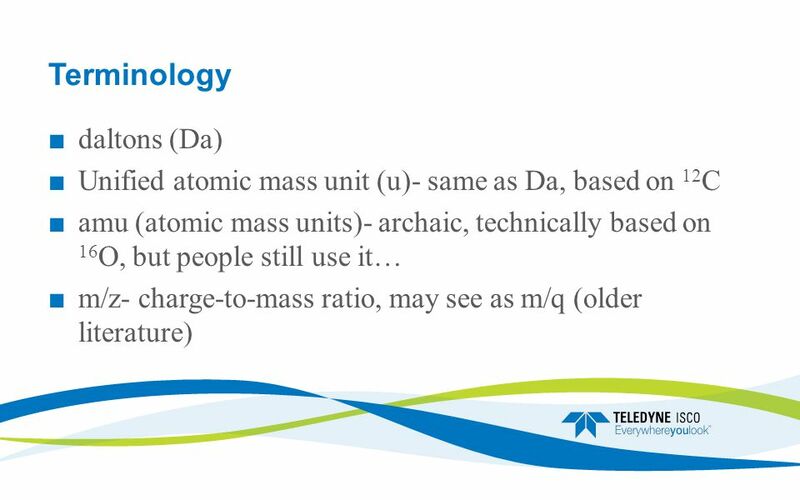 Mass Spectrometry Chem 3500 Mass Spectrometry Y. Zhao Lecture 2 A Glimpse of Mass Spectrometry Began from 1920s: Aston, Dempster, Thompson MS is often. 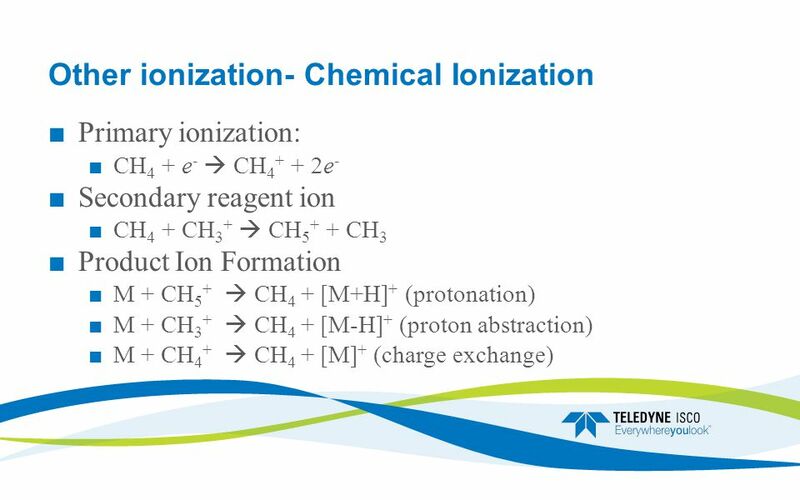 Mass Spectrometry Mass spectrometry involves ionizing a compound, separating the ions that result on the basis of mass to charge ratio (m/z) and obtaining. 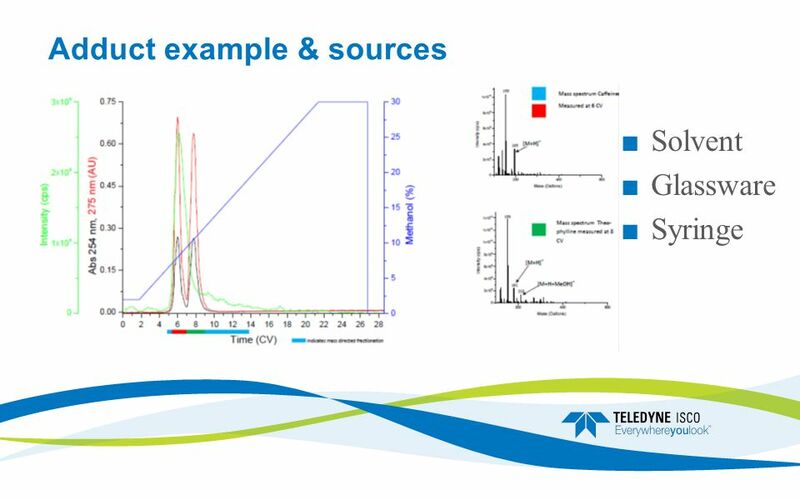 Les détecteurs de masse : une révolution en chromatographie 1ère partie : Introduction à la spectrométrie de masse Pr. 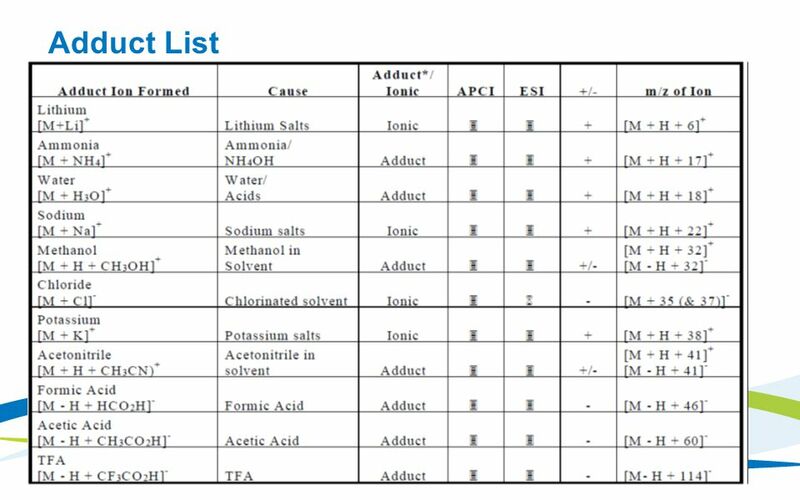 Jean-Louis Habib Jiwan UCL – Département. 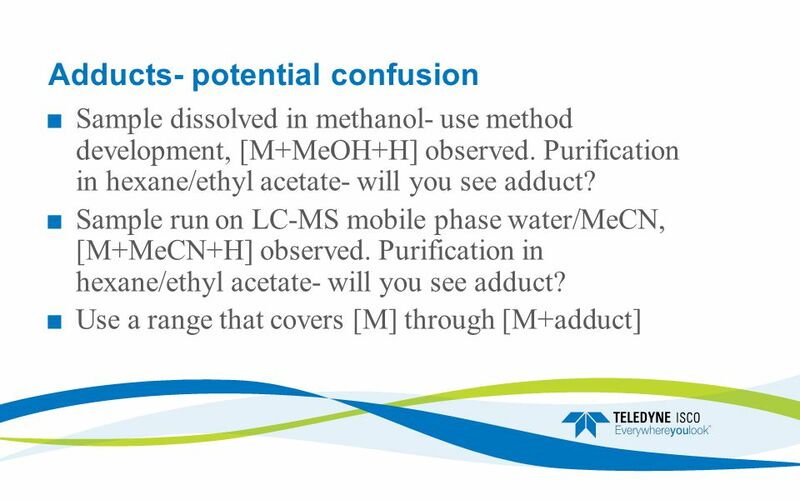 Module 2: Analytical methods and separation techniques. 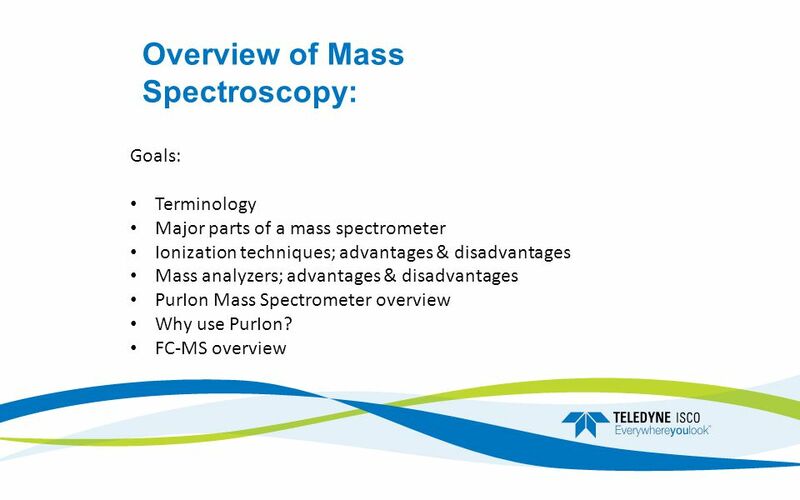 Mass spectroscopy. 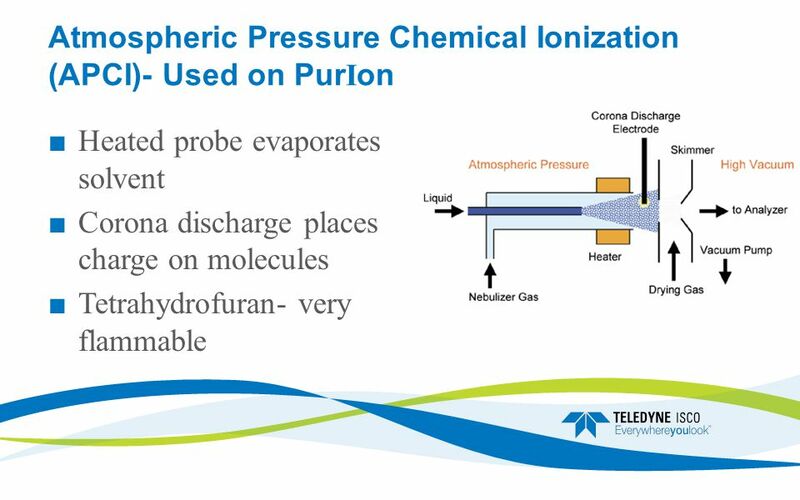 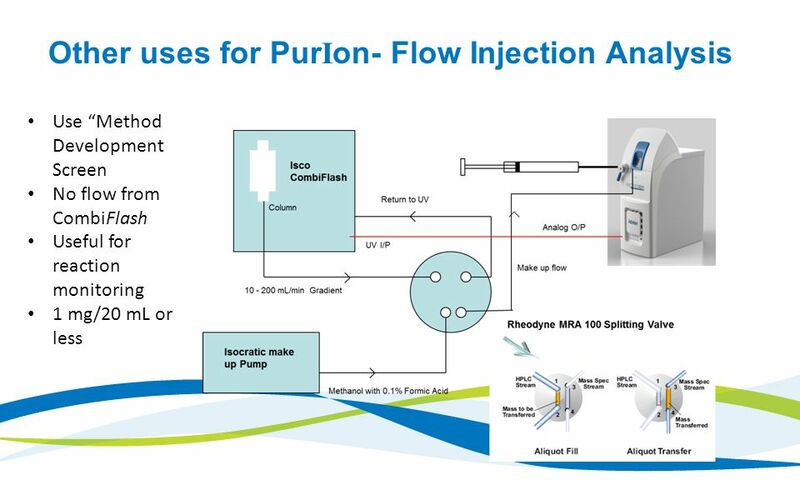 In a typical MS procedure:  1- a sample is loaded onto the MS instrument, and undergoes vaporization. 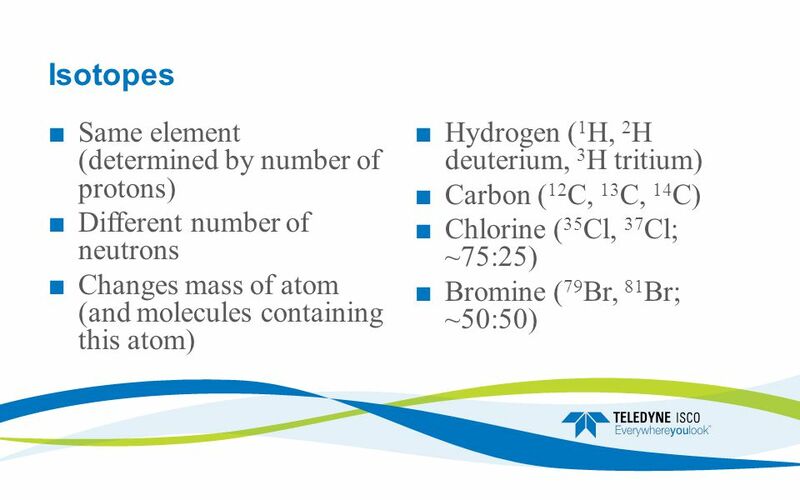  2- the components of the sample. 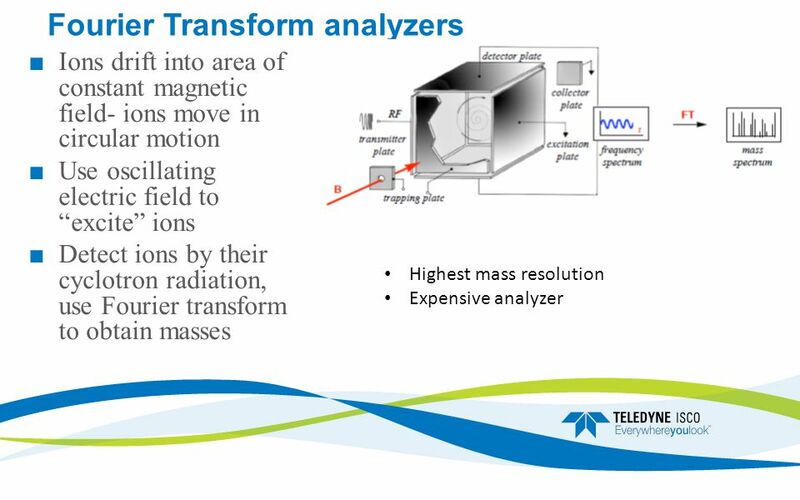 Mass Spectrometry Dr. Karin Habermehl-Cwirzen. 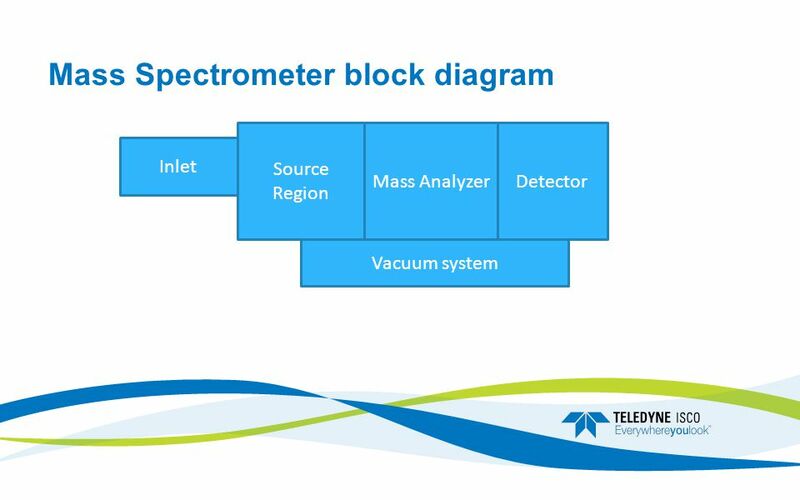 Mass Spectrometry measures individual molecules Definition Mass spectrometry is a method in which a sample. 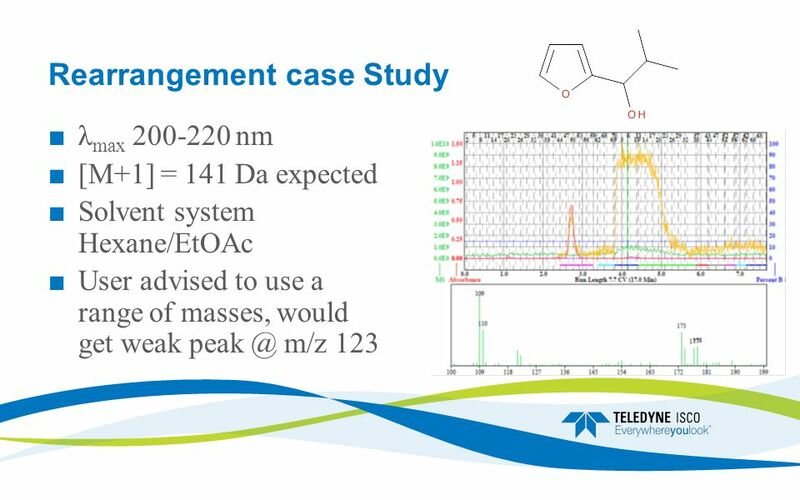 12-1 Molecular Mass Spectroscopy Molecular structure Composition of mixtures Molecular mass spectra Ion Source Mass Spectrometers Applications. 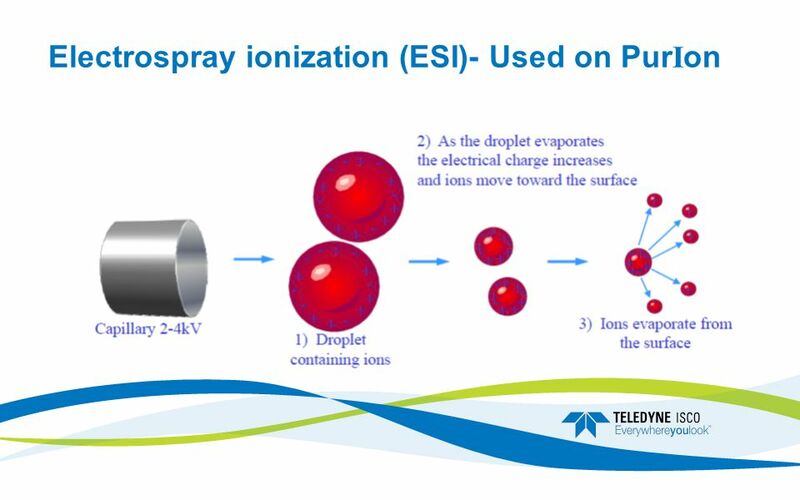 Mass Spectrometry The substance being analyzed (solid or liquid) is injected into the mass spectrometer and vaporized at elevated temperature and reduced. 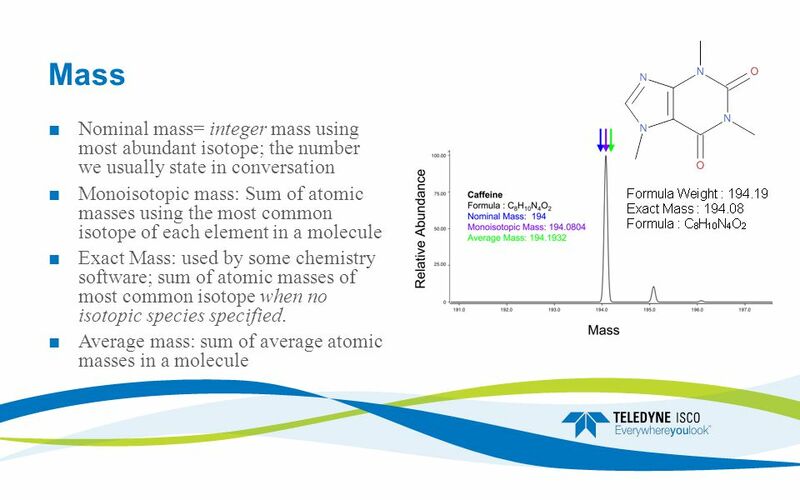 Mass Spectroscopy Mass Spectrometry ä Most useful tool for molecular structure determination if you can get it into gas phase ä Molecular weight of. 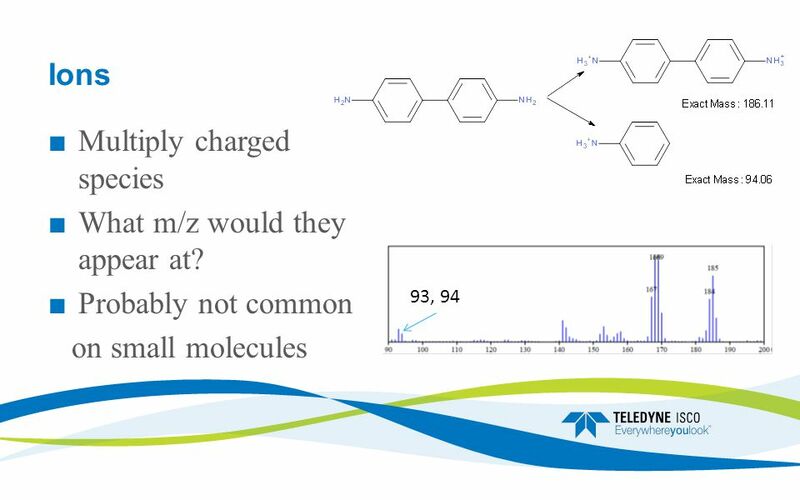 Chapter 20 Molecular Mass Spectrometry. 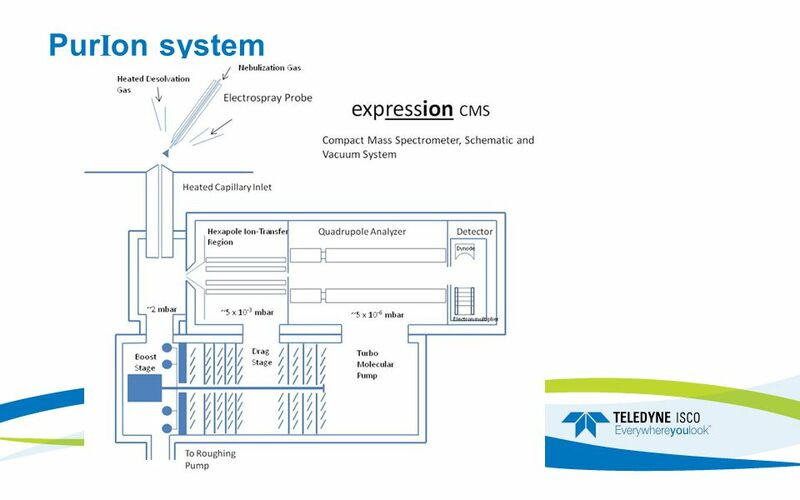 Introduction... Mass spectroscopy is perhaps one of the most widely applicable of all the analytical tools available. 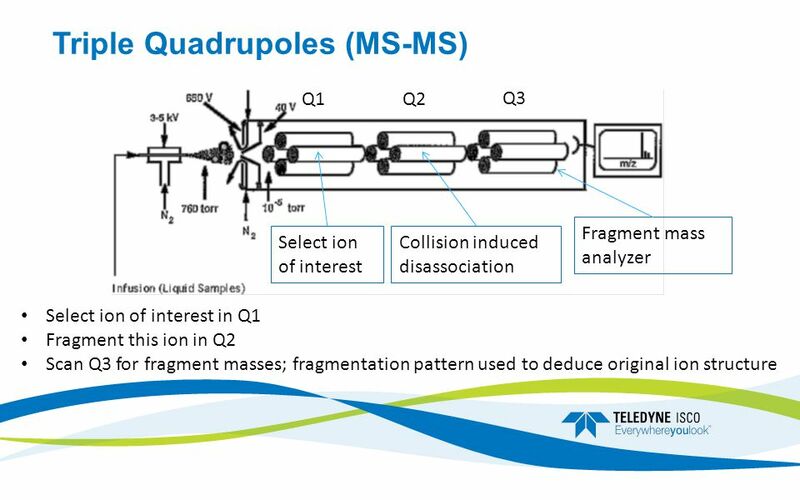 Mass Spectrometry. 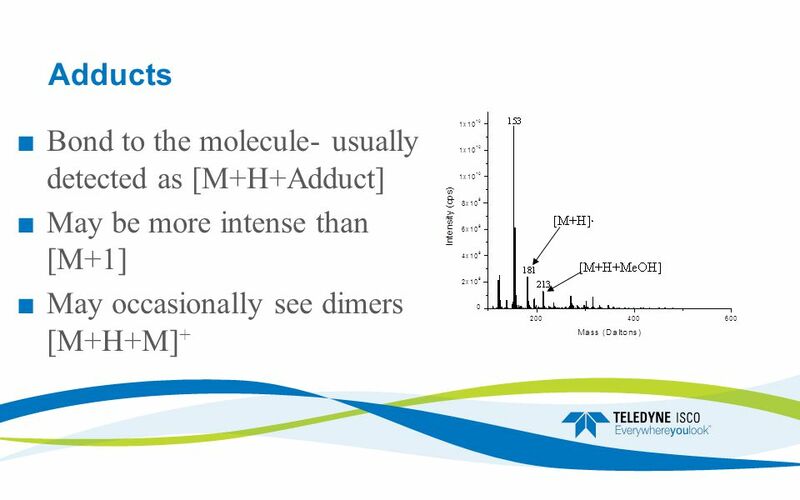 How is MS Done? 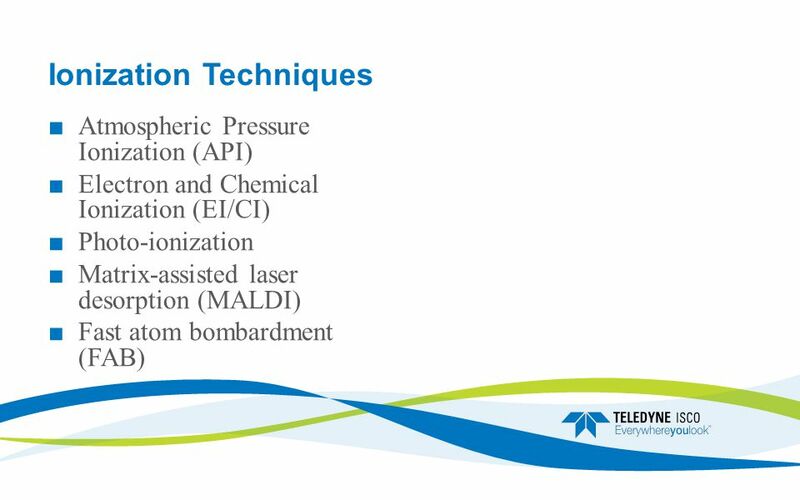 Basic MS Instrumentation. 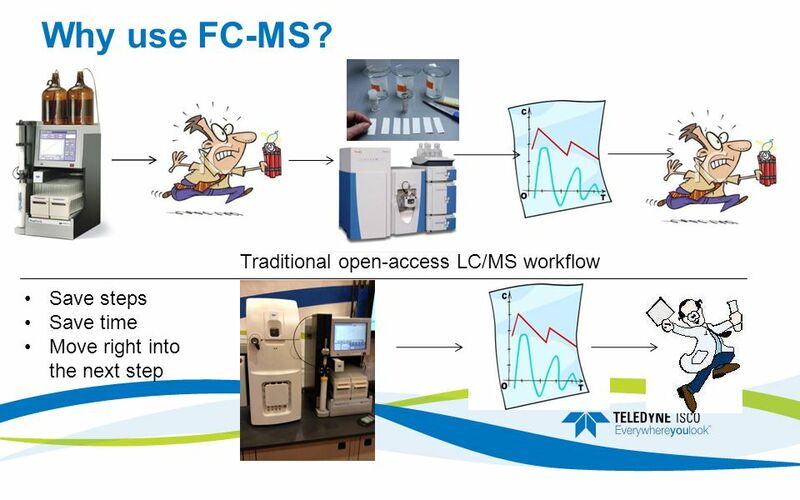 LC-MS Based Metabolomics. 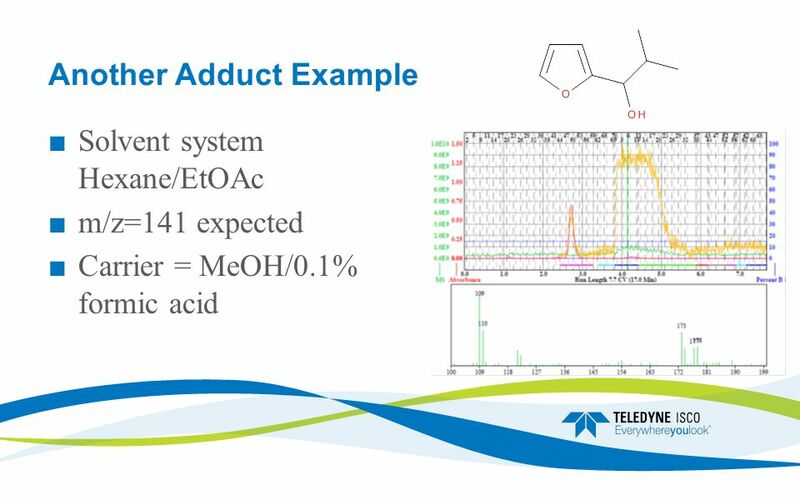 Analysing the METABOLOME 1.Metabolite Extraction 2.Metabolite detection (with or without separation) 3.Data analysis. 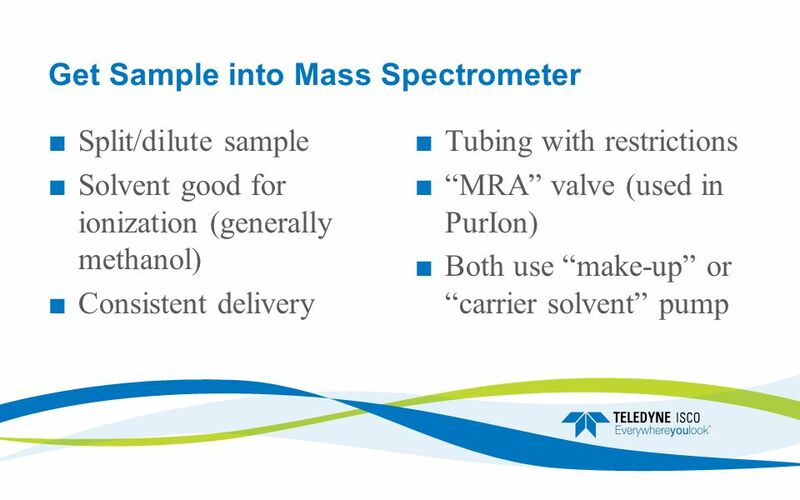 PROTEIN IDENTIFICATION BY MASS SPECTROMETRY. 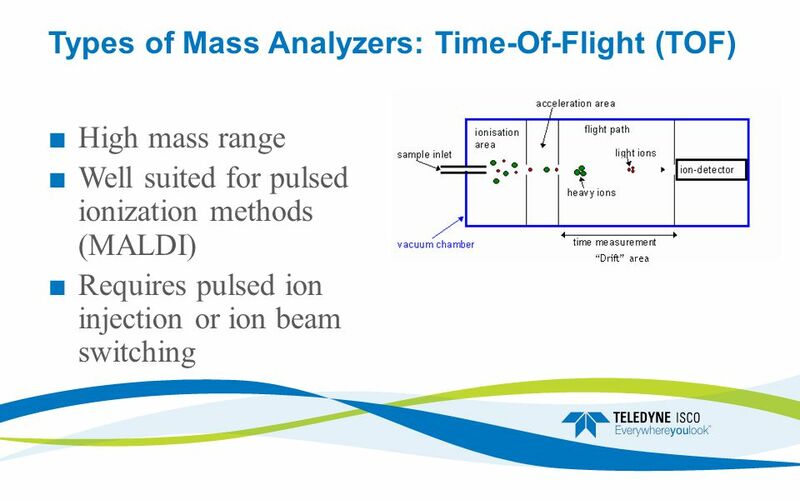 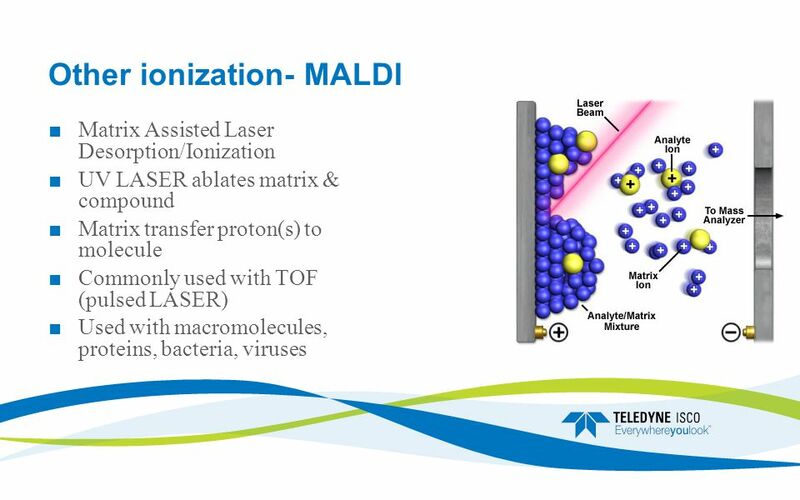 OBJECTIVES To become familiar with matrix assisted laser desorption ionization-time of flight mass spectrometry.